Sarah loves to go swimming. But what that really means is she loves to go to the outdoor pool at the Y where the water at its height hits chest level on her in the toddler area. Anytime we have taken her to swim in the indoor pool she has screamed bloody murder at the top of her lungs. Rather embarrassing when you consider how echo-y indoor pool areas are. The lifeguard always looks at us with a mix of annoyance and pity. 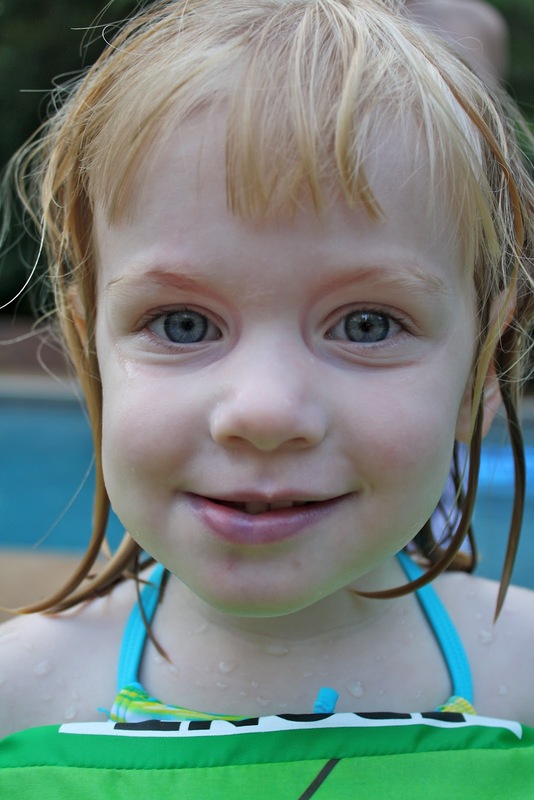 A couple of months back we went swimming with Sarah's best friend Jessie and her mom. Jessie is a pro and really not afraid of anything. So she swims around happily wearing her Puddle Jumper. Meanwhile, Sarah was screaming and trying to convince Jessie there were snakes in the water. Anyway, fast forward to summer and the outdoor pool opens and all our problems were solved because she has no problems outside. But then we were invited to Aunt Melissa's parent's house to swim on Memorial Day. Ugh. Man, I did NOT want to take my freak of nature over to that house to have her scream and act crazy in front of my in law's in laws. I'd rather keep our embarrassing outings within our own immediate family. However, Sarah LOVES her boys. She'd pretty much jump off a cliff if she saw 'Nays and Haw-nins do it first. So Chris and I went to Walmart to find a Puddle Jumper for Sarah. I made a big deal about how she was going to swim like Jessie and let her pick out which design she wanted. We tried it on in the store and I gave her a lot of praise for what a big girl she is. Then we got to Aunt Melissa's parents house and it was time for the moment of truth. She was a little uneasy at first but Uncle Adam coaxed her in and somehow got her to let go of him. And there she was swimming like a big girl with her boys. She was so happy! She even got in and out of the pool using the ladder all by herself. She had a great time. Unfortunately, Aunt Melissa is holding those photos hostage so I can't post those. But I can post these. We crashed the Sheppards house this past Friday when I called to invite Melissa and the boys to come swimming at the Y and she said, "Oh no....we're about to head to my parents house to swim." Then she very tensely said, "You wouldn't want to come there, would you." You know those invites, the ones you don't really want the person to say yes to. Ha! She got more then she bargained for when I said, "We sure would! We'll pack up right now. See you in a few." Sarah just has so much fun swimming with her boys. It was a lot of fun for everyone! I think Chris likes swimming with the boys more too! He was having a great time having splash fights and teaching the boys how to do "depth charges". Then when Uncle Adam got off worked and joined us we played Sharks and Minnows. Sarah enjoys riding on the boats as she calls them. Since the boys were wearing goggles Sarah wanted to wear some too. Luckily Chris had a pair of children's goggles that he has worn multiple times because he didn't realize they were kids goggles. And it wasn't until this time that we figured it out. He put them on Sarah and we laughed hysterically and how crazy it was that he use to wear those to swim laps! I'm really thankful that Chris's brother and family live in town so Sarah can enjoy moments like these with her cousins. My family never lived near our cousins growing up. In fact, I have cousins I've never met or haven't seen in over 20 years. I don't feel like I was deprived or anything but I do see how having her 4Hs so close for play dates has enriched her life immensely so far. It does at times make me miss my brother and sister and their families. Especially since Cody won't get as much Henry time as I'd like for our little "twins" to have. Jack has the same frog floatie and it's the best thing ever!!! She looks like she is having a blast!